A couple of years ago I developed a pocketable, palm-held joystick system for my Artoo. It started off as an add-on to my PS2/XBee setup but quickly became obvious it should be standalone controller. Current prototype (Feb 2013) – operator uses two of these to control a droid. With this system, I can stand next to my Artoo and no one has a clue Iâ€™m the one driving. 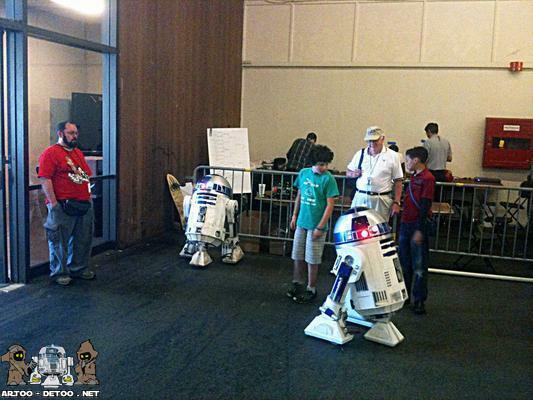 I can have conversations with other observers, or even go as far as standing in line for photos with my Artoo. 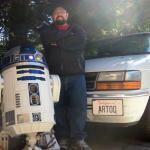 Artoo can even appear to be autonomous and respond to “verbal” commands. When in fact I’m using simple gestures on the joystick to trigger things. Although I have more complex control options configured in my droid, during the last few years, Iâ€™ve had the most fun wrangling with my Pocket Remotes. Itâ€™s proven to be reliable and a real crowd-pleaser. So, as you can imagine, Iâ€™ve gotten repeated requests to offer this technology to the club and beyond. Right now Iâ€™m in the process of refining and simplifying the design to make it more useable by many more people. I have several new prototypes on my bench and will be conducting 3rd party field tests shortly. I’ve added up the cost of the components in my new controller and it’s a lot more than I thought. It would probably be close to $300 to recreate one of these with the external joysticks. I’d hate to think of all the parts I bought that I either destroyed, never used or special cables/bits I needed for programming. You could bring down the price by sourcing parts from eBay, and you could use the cheaper 2.4GHz XBee’s, or simplify and remove the LCD or external joysticks. Then the cost would be close to $150-200, but that does not include the hours needed to make the custom PBCs I hand made. 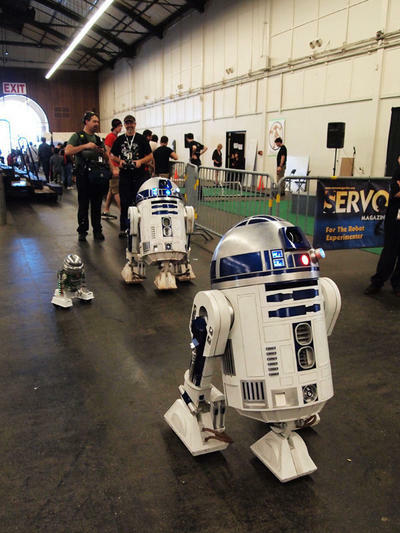 RoboGames was a huge success, and I had a blast driving Artoo around with my new controller. I lost count how many people thought he was autonomous. I could stand 5 steps away and nobody would bug me or even notice I was there. 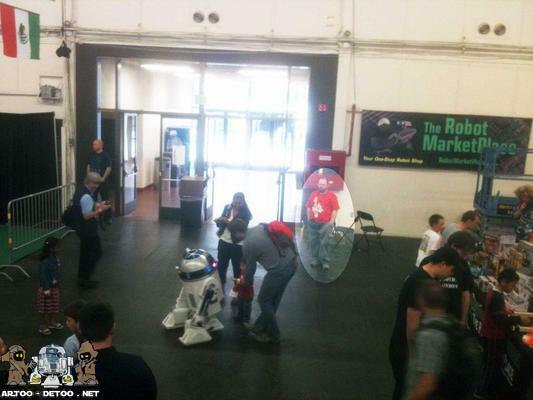 I could mingle in and out of the crowd, walk past Artoo – zero response. A lot of people would ask around who was controlling him, and I would respond “If you find out let me know”. One downside is that I had my hands in my pockets the entire day, so didn’t take many photos. Big thanks to Jonathan and Matt who took most of these photos. On Saturday I hadn’t thought ahead, and hiding the controller in my coat pocket wasn’t such a great idea. It was a hot day and I quickly overheated and paid the price at the end of the day. On Sunday, I remembered to bring my fanny pack to hide the controller in. 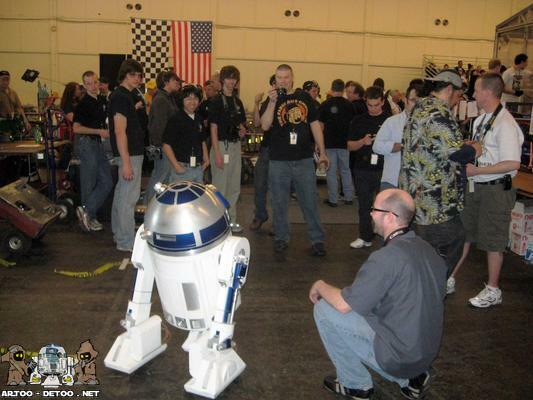 Here I am again, standing to the left of Artoo chatting to someone, with most people oblivious that I was really controlling the droid. 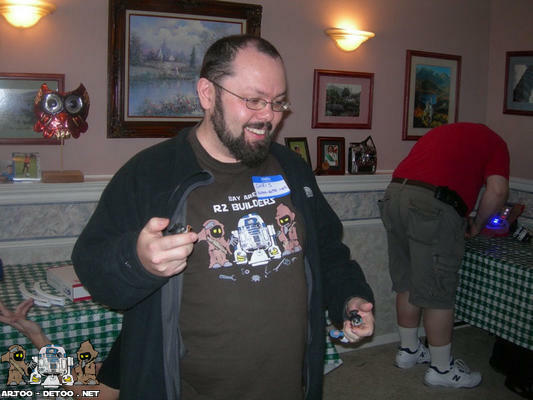 Unfortunately, I don’t have any photos of us together, but did find this shot on flickr of our droids and Matt in the background. It’s probably my favorite photo from the weekend. Original photo by human fiction. Bonnie Burton from Lucasfilm covered the event live on Twitter, and she also took some great photos. Onto some of the more technical aspects of the weekend, including problems and lessons learned. RoboGames was an ideal place to field test my new controller, it’s probably one of the most extreme wireless environments I could find. There are so many different devices and robots in attendance that if something was going to trip me up, this event would. For the most part I don’t think I got any radio interference (I ran with the 900 MHz XBEE’s.) There was one instance, in the hall hosting the BotBall Tournament, where I lost communication, but I’m not sure if it was radio related. I did a reset of the system and control was restored. I also ended up doing a lot more work prior to the event to integrate the controller into my current setup. The original goal was to only control main drive and dome, but I got that done pretty quickly after moving everything over from my demo platform. I worked out I could tie in the Arduino and control 90% of what I have in the droid. It required a lot more software and wiring, and I started to hit limits on the basic way the Arduino (and pretty much all simple microntrollers) are programmed. As a result I started to work on some multi-threading code to help coordinate activities. On Saturday, Jonathan arrived at my house to help load but found me feverishly trying to fix a last minute glitch. Magically overnight a servo had failed and I was busy trying to figure out why. Long story short, a batch of cheap servo from China was having problems returning to center and drawing way too much power. This would probably explain why my dome controller had been overheating this last few months, as it was supplying power to the couple of servos I have in the body. So I cut my losses and disabled the Leia Holographic for the today. Once we got to the games, I decided to use the hidden joysticks exclusively and was super surprised how easy it was to control. Even though the external joysticks were mechanically the same as the internal, for some reason because I was reading them as direct analog, I had finer control of the droid. On Sunday morning I awoke again to problems in Artoo. I have so much new wiring, and none of it really planned, something was bound to go wrong. He’s recharged over night and when I figured him up to drive him out to the van he would move. His normal bootup sound didnt play so I knew something was up. I checked the built in battery meter and it was showing 19V. I knew this wasn’t possible so suspected something had shorted. I’d a similar issue before, and it was one of the small 7805 voltage regulators on the power board. It had overheated and failed, so instead of delivering 5V to some systems it was allow 12V thru – and tricking the power meter to show 19V. I swapped it out and we were back up and running – but I really should think above removing those 7805’s from the setup. I’m also not sure if I want to continue the development in my current droid. I still have my old setup in there and can flip back and forth, but the wiring has become and issue (and probably the cause of the short on the 7805.) At some point I will need to decide which direct I want to go and rewire or keep the new controller for droid #2. A couple of years ago I started to work on alternate control methods for my droid. I’m happy with my Futaba controller, but it’s pretty bulky and heavy, and it would be nice to be able to hide in a crowd without stuffing it in a restrictive bag. The secondary goal was also to allow more easier scripting of complex routine that I’d started to build into my droid. You can only do so much with the channels provided on an RC controller. For a while I thought phone control was the answer and I developed a Windows Mobile application that could interface with my droid and allow simple function. But I wasn’t happy with driving with a touchscreen. Nothing beats a real analog joystick for fine control. Also, at the time multi-touch input wasn’t available on phones, so as soon as I stopped to click on an action like sound, everything else stopped, e.g. driving. Communication was via wi-fi on the phone to a small computer onboard Artoo. It worked pretty good until I turned on my regular Futaba radio controller. It also runs on the 2.4GHz spectrum and it crippled my new wi-fi controller. So I shelved the project because most of the events I go to there are lots of other radios. Then about a year ago I started to dabble with XBEE and using it to control my droid. I went thru a few prototype setups and came up with a very workable solution that I demonstrated at R2LA in October 2010. At it’s heart are two Arduino micro-controllers that talk via XBEE. The smaller Arduino is tethered to a Playstation controller, with an added LCD screen to help with function selection and setup. It sits on a custom board to tie it all together, which looks bigger in the photo than it really is, but I wanted to show the setup. The second Arduino is the brains in the droid and interfaces to the speed controllers, servos, and a VMusic2 for sound. I chose an Arduino Mega because it has 4 hardware serial connections and plenty of IO for future expansion. Initially configured to control 11 servos but the board can handle dozens and dozens. The beauty of using XBee is that there are several different version that run on differnt frequencies (e.g. 2.4GHz, 900Mhz), but are also plug compatible – so switching from one to another is very easy. For my tests I focused on 900MHz as I really wanted to avoid the crowded 2.4GHz spectrum. Even though the Playstation controller is relatively small compared to my Futaba setup. I still wanted to reduce the size further or allow me to hide it all together. I decided to add additional joysticks which are tethered to the main controller. I can hold them in the palm of my hand, and if I hide the wires in the arms of my jacket or shirt, then nobody is the wiser. In this mode control is limited to dome, drive and triggering sound but that’s good enough for me right now. Okay, the NPCs and AX3500 was total overkill but it was all I had on hand. I drove it in from the car with the controller hidden and the extension joystick in my hand. 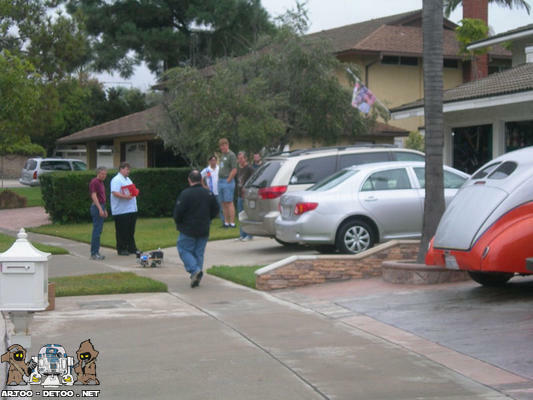 People thought it was an autonomous robot and didn’t quite understand what or why it was there. They soon realize it was with me, but very few people spotted the controllers and they continued to talk to me thinking it was autonomous (while I drove it around the room.) When I finally told people they were very surprised. I’ve not touched the project since last October, but this week I finally got it out and worked on testing it in my droid. Early tests on a full size droid are looking good, the little analog sticks aren’t as precise as those on the Futaba but I can live with it for now, especially if I can switch back and forth. And being able to totally hide the controller is awesome!